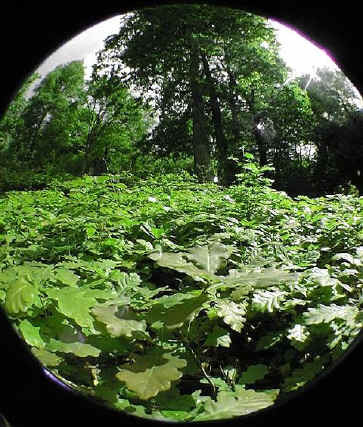 The picture on the left has been taken with a very wide angle lense so that both the oak seedlings in the foreground and the parent oak tree can be shown. In order to grow, each one of the carpet of seedlings has to get enough water, light and nutrients. It is therefore in competition with all the plants in the area for these. Space is also a limiting factor. Clearly there is not enough room for all these oak seedlings to grow into large oak trees. The seedlings are not only in competition with each other but with all other plants in the immediate area. This includes the parent tree whose leaf canopy and root system stretch out for a considerable distance. It is therefore important that the seeds of parent plants are dispersed. There are a number of ways this happens depending on the type of plant and the size of the seed. Click on the here to find out more.